A man suspected of involvement in a mysterious dissident group's February raid on North Korea's Embassy in Madrid was arrested in Los Angeles by U.S. authorities. Christopher Ahn, a former U.S. Marine, was arrested and charged Friday, according to a person familiar with the matter. Separately, on Thursday, federal agents raided the apartment of Adrian Hong, a leader of the Free Joseon group, the person said. A British mother and son were killed while eating breakfast at a five-star Sri Lankan hotel as a string of suicide bombs ripped through the country on Easter Sunday, killing almost 300 people. Alex Nicholson, 11, his mother, Anita, 42, were killed while dining at the second-floor restaurant in the Shangri La hotel in the country's capital, Colombo, on Sunday as it was gutted in one of several explosions which hit the country. The schoolboy's father, Ben, survived, while The Telegraph was unable to account for the whereabouts of the couple's youngest daughter. 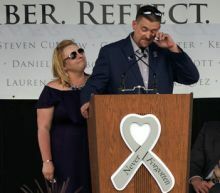 A week-long series of events commemorating the 20th anniversary of the Columbine High School massacre culminated on Saturday with a remembrance ceremony celebrating the lives of the 13 victims slain in the rampage. On April 20, 1999, two Columbine students, just three weeks shy of graduation, stormed the suburban Denver school armed with shotguns and semiautomatic weapons, fatally shooting 12 students and a teacher before committing suicide. Addressing hundreds of people gathered at Saturday's service in a park next to the school, Dawn Anna, mother of slain student Lauren Townsend, spoke on behalf of all the families of the victims about their sense of loss. On April 9, 2017 two churches are bombed on Palm Sunday, killing 45 people. 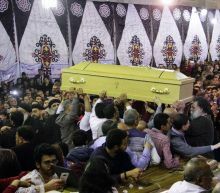 On March 27, 2016, 75 people including many children are killed and hundreds are injured when a bomb packed with ball bearings explodes near a popular park in Lahore where Christians were celebrating Easter. On April 8, 2012, 41 people are killed in a car bomb attack on Easter Sunday near a church in Kaduna, a key cultural and economic centre in the north that has been hit by the Islamist group Boko Haram. Ukraine's most-watched comedian won a landslide victory in Sunday's presidential runoff as voters vented their frustration at the ex-Soviet republic's lack of progress since a revolution five years ago. Volodymyr Zelenskiy, a 41-year-old TV comic who's tapped into fury at the political class, got 73 percent of ballots after almost 99 percent of votes were counted. Incumbent Petro Poroshenko, who conceded defeat after exit polls showed his loss, garnered 25 percent as of Monday morning. Meghan McCain isn't mincing words when it comes to her take on anti-vaxxers. "The View" co-host took to Twitter Friday to send a message to those who do not get vaccinated. "Dear (anti-vaxxers), your stupidity and arrogance are putting the lives of children in danger!" 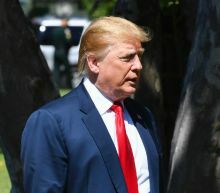 Donald Trump has launched a fresh attack on Democrats, accusing the party of unspecified illegality following a weekend of talk about his possible impeachment. Democratic leaders have refused to rule out starting proceedings to remove the president from office after a heavily-redacted version of the Mueller report was released on Thursday. Some prominent party figures, including 2020 presidential hopefuls Elizabeth Warren and Julian Castro, have gone further by making outright calls for the impeachment process to begin. Does Trump prefer Biden or Sanders as an opponent? A man has been arrested after a woman who was five months pregnant was found dead in a Brooklyn apartment. The Easter Sunday attacks on three churches in Sri Lanka mark a devastating escalation of violence against a Christian minority that has been targeted in the past, but never to such brutal and deadly effect. 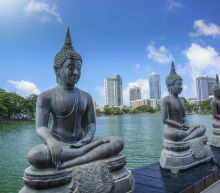 Ethnic and religious violence has plagued Sri Lanka for decades, with a 37-year conflict with Tamil rebels that claimed 100,000 lives and an upswing in recent years in clashes between the Buddhist majority and Muslims. The US State Department's most recent report on religious freedom said the National Christian Evangelical Alliance of Sri Lanka had documented "97 incidents" of attacks on churches, intimidation and violence in 2017. U.S. stock index futures dipped on Monday as investors returned from their Easter break and took a cautious stance at the beginning of what is expected to be the busiest week of the first-quarter earnings season. The S&P 500 closed slightly lower last week, ending its three-week winning streak, but hovered about 1% away from a record high hit in September on U.S.-China trade hopes and a largely upbeat earnings season. 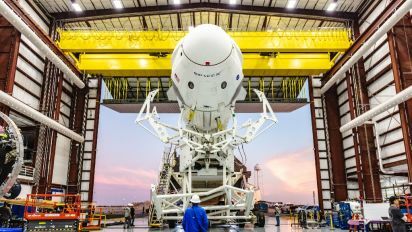 More than a third of the S&P 500 companies, including Boeing Co, Amazon.com Inc and Facebook Inc, will report this week determining whether investors should be concerned about the start of an earnings recession or whether back-to-back quarters of negative growth can be avoided. A comedian who plays the president on television has turned art into real life in a landslide election against the incumbent in conflict-torn Ukraine, according to exit polls. Volodymyr Zelenskiy, 41, had 73 per cent of the vote against 26 per cent for Petro Poroshenko, 53, who was elected after protests toppled a pro-Russian leader in 2014. 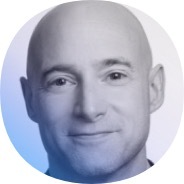 The story is remarkably similar to the hit show Servant of the People, where a teacher played by Mr Zelenskiy is elected president on the strength of a viral video rant. If you're in the mood to eat out Sunday, you'll find more restaurants are open Easter than were for Christmas. National chains, including Starbucks, McDonald's and Dunkin', will be open, along with IHOP, Denny's and Waffle House. But according to an analysis by Womply, a small business software provider, 23% fewer restaurants are open on Easter compared with a typical Sunday, so your options might be limited. Tourists, devout Catholics and others looked on mournfully at Notre Dame Cathedral Saturday, regretting that they couldn't get inside the magnificent monument on this Easter weekend because of the damage caused by a violent fire. Parishioners who normally celebrate Easter at Notre Dame attended Saturday evening's Easter Vigil Mass at the nearby Saint-Sulpice Church instead. They were joined by other visitors who had hoped to celebrate Easter in Notre Dame, the 12th century cathedral whose priceless relics include the Crown of Thorns purported to have been worn by Jesus at his crucifixion. Senator Elizabeth Warren (D., Mass.) rolled out a policy proposal Monday that calls for the use of public funds to pay off hundreds of billions of dollars in outstanding student loan debt. Under the proposal, the government would pay off some $600 billion in outstanding student loan debt over the next ten years using revenue derived from a so-called “ultra-millionaire tax,” an annual 2 percent tax on wealth over $50 million plus an additional 1 percent on wealth over $1 billion. The Democratic presidential contender's plan, which aims to eliminate $1.25 trillion in total student debt over ten years, also calls for a $100 billion increase in federal student aid that does not have to be paid back. Task and Purpose Security, Americas What will happen? A Texas veteran is suing the company he says knowingly produced and sold defective earplugs which were issued to the U.S. military, leading him and many others to develop hearing problems, including tinnitus. Sgt. Scott D. Rowe, who served in Iraq during Operation Iraqi Freedom from 2003 to 2004, told the Houston Chronicle that he's "never at peace" from the "high-pitched frequency" he hears every day, as a result of the earplugs he received from 3M Company. A recent video posted by YouTuber Innovation RC clearly demonstrates just how insane RC cars can be, with one of the pint-sized speed demons hitting an absolutely absurd speed of 124 mph in less than eight seconds, all while hauling a not-super-light action camera and traveling over what seems to be a fairly rough surface. Radio-controlled vehicles used to be near the top of every kid's wishlist, and perhaps some of them still are, but these aren't your grandfather's RC toys. These tiny cars are built with performance in mind, and enthusiasts regularly modify them in an effort to push the hardware to its absolute limit. Santa Ana police are issuing a warning for parents regarding a man released on bail who is accused of using an online dating app to meet and assault a 15-year-old boy. The US State Department has warned of possible terrorist attacks in a revised travel advisory for Sri Lanka, after a series of deadly blasts killed nearly 300 people -- including Americans -- in the island nation on Easter Sunday. 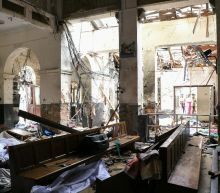 Sunday's attacks saw suicide bombers target churches during Easter services and high-end hotels in the capital Colombo. Secretary of State Mike Pompeo said "several" Americans were killed -- the worst violence to hit Sri Lanka since a long and bloody civil war ended a decade ago. Donald Trump's top lawyer on Sunday attacked "calumny, lies and distortions" in the Mueller investigation report, and said there is "nothing wrong" with taking hacked information from Russia. Rudy Giuliani mounted a combative defense of the president in Sunday talk show appearances that took aim at Special Counsel Robert Mueller's investigators, the evidence they amassed and the witnesses they cited. The former New York mayor heaped special scorn on Senator Mitt Romney, a former Republican presidential candidate who said Friday he was "sickened" by the report's findings and "appalled" that Trump's election campaign "welcomed help from Russia." 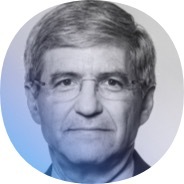 Does reaction to the Mueller report reveal the impact of the populist revolution that swept Trump to power?